Agonist has recently come out with a new perfume which spurred the memory of this perfume and it’s crazy abstract bottle. So I dug out my sampler vial and gave her a sniff. In Bottle: Dark, earthy blackcurrant note. The blackcurrant is the most prominent smell I’m getting so far from The Infidels. Applied: Yep blackcurrant. Not the sweet berries or tea-like blackcurrants, but this earthy, dark jammy blackcurrant note that’s very rich and dense. That currant note is an ever-present entity during the entire fragrance as The Infidels digs into the mid-stage with a slight showing of florals that helps with that earthiness. It’s not particularly interesting in the mid-stage but the end game is a bit better, as The Infidels takes it blackcurrant and plays in a touch of lavender with a woody, green patchouli and warm amber. Very interesting fragrance, though is the juice worth its price? I’m going to have to say that while this stuff smells interesting, it isn’t the best or even anywhere near my top fragrances. So to me, no, it’s not worth the price. Extra: Priced at $495 for 1.7oz, The Infidels is quite a bit out of reach of most people’s budgets. This is one of those fragrances that have been priced so beyond affordability and practicality that it lands in Clive Christian territory, and that’s a double-edged sword. You can, however, bite the bullet and purchase the glass art bottle for $495 and get the subsequent refills for a–all things considered–reasonable $90 for 50ml. Design: The design for this bottle is polarizing. There are people who think it’s a beautiful piece of abstract glass art and other people who just can’t figure out what it’s supposed to be. And some people who look at it and simply think it’s hideous. I’m a member of the, “Oooh! Glass art!” crowd. Agonist’s bottle is probably most of the price of the juice as it’s truly a beautiful, misunderstood, piece of artwork. 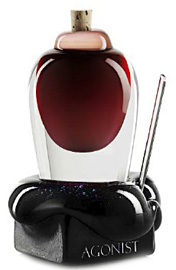 It’s unlike any other perfume bottle I’ve seen out there, it’s strange, it’s compelling, it’s dramatic with the contrast between the redness and black and clear glass. It’s got that crazy application stick too that you don’t see much of. Everything about this bottle speaks of daring, dangerous, and blood. The fragrance isn’t shouting that stuff but the packaging certainly is and I appreciate this thing for the artistic merit of it and the boundaries it pushes in traditional and contemporary bottle design. This bottle is like the high fashion runway. You don’t have to understand it to appreciate it. Notes: Blackcurrant, green cumin, bergamot, magnolia, tonka, lavender, patchouli, amber, labdanum. Let’s not kid ourselves, the major reason to own this perfume is for the bottle. The juice inside is pleasant enough but it’s second fiddle to the packaging. Reviewed in This Post: The Infidels, 2010, Eau de Parfum. This entry was posted in agonist, earthy, fruity, Reviews By House and tagged amber, bergamot, blackcurrant, green cumin, labdanum, lavender, magnolia, patchouli, tonka. Bookmark the permalink.